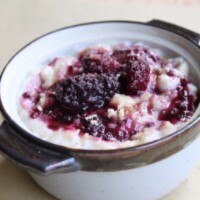 This week, we're sharing oatmeal recipes worth getting out of bed for! We'll be back next week with more specials, recipes, and ideas! Tangy goat cheese balances the tartness of blackberries in this indulgent recipe. Rich in soluble fiber and high in antioxidants, blackberries are a nutritious way to top off an already healthy bowl of nutritious oats. Drizzle Scottish Honey on top for a truly decadent start to your day. Use your favorite Mrs. Bridges preserve or jam with this protein packed delight! Kids love it! 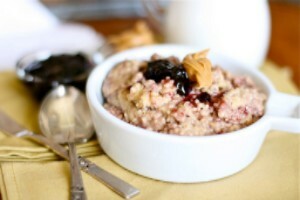 Forgo the bread and make PB&J oatmeal instead! Loaded with fiber and protein, peanut butter is filling and nutritious oatmeal mix-in that will keep you satisfied until lunchtime. Add some all-natural jam and you’ve got yourself a big bowl of awesome! We suggest the Morello Cherry or Scottish Blackcurrant and Blueberry!